Members of the FCEDC Board of Directors and Finney County Commission tour the Flat Mountain Brewhouse in downtown Garden City Wednesday. Renovations are in full swing and a soft opening is planned for Dec. 27-28. Flat Mountain Brewhouse is a hive of activity right now as workers strive to get the new restaurant and brewery in downtown Garden City ready for a soft opening in late December. 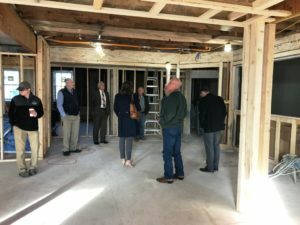 On Wednesday, Finney County Commissioners and the Finney County Economic Development Corp. Board of Directors had the opportunity to tour the building and get a sneak peek of what’s to come downtown. Located at 207 N. Main St., formerly the home of The Bike Rack, Flat Mountain Brewhouse has been under renovation for about a year and is owned by a partnership group that includes Jorge Guzman, Carlos Mantilla, and John Chappel. John Chappel talks about the brewery during a tour of Flat Mountain Brewhouse on Wednesday. “We’ll have 12 different beers that we’ll be producing. 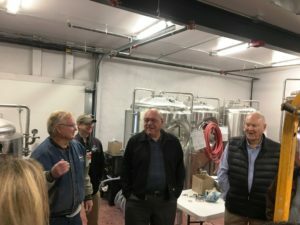 It’s probably going to take us, after we get the brewery up and running, to have all 12 going, probably 60 to 90 days to have that many beers in the process,” Chappel said. 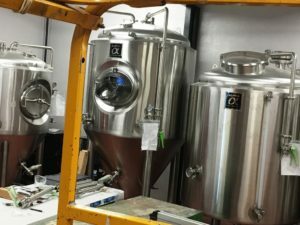 At the official opening, which Chappel estimates will be the first or second week of January, the brewery will likely have four to five craft brews ready to go. “It may take awhile to get the dark beers and get things the way we want,” Chappel said. So will there be an official house brew? To prepare for the craft brew scene, Flat Mountain tapped the services of David Mentus, a craft beer consultant based in Colorado who has decades of professional experience in brewery operations. Mentus has provided his experience to local brewmaster Cody Cundiff, no slouch himself in home brewing. The renovated space is beautiful to behold, with a mix of wood and iron creating a rustic yet elegant ambiance. 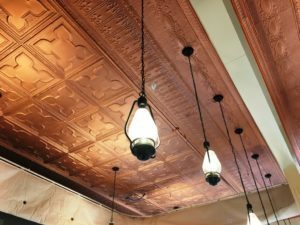 During the renovation, Chappel uncovered the original white, tin ceiling, repaired it in spots and painted it a stunning copper color. The main level will have a capacity of about 120 people, another 30 downstairs and 60 in the upstairs portion. On the main floor, booths will line the north and south walls with tables interspersed through the remaining space. Chappel said along the north wall a mural is planned, featuring old photos of Garden City in a kind of timeline motif. 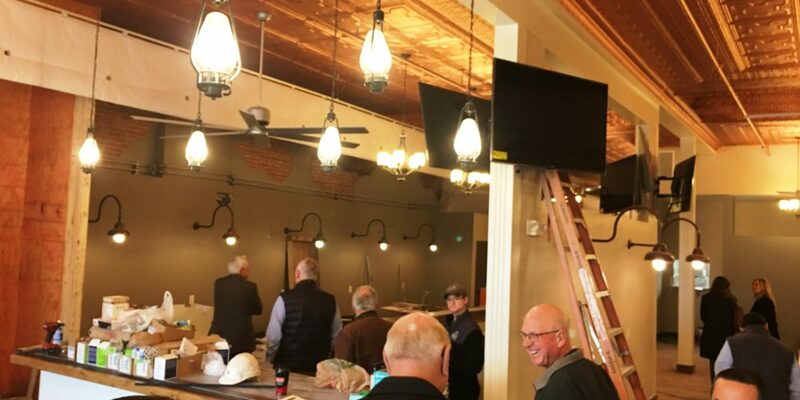 The basement, which Mindy Allen, of Mindy’s Murals, is painting to resemble a wine cellar, is intended to have a kind of a wine bar feel and atmosphere, and will be a good place to have private gatherings. 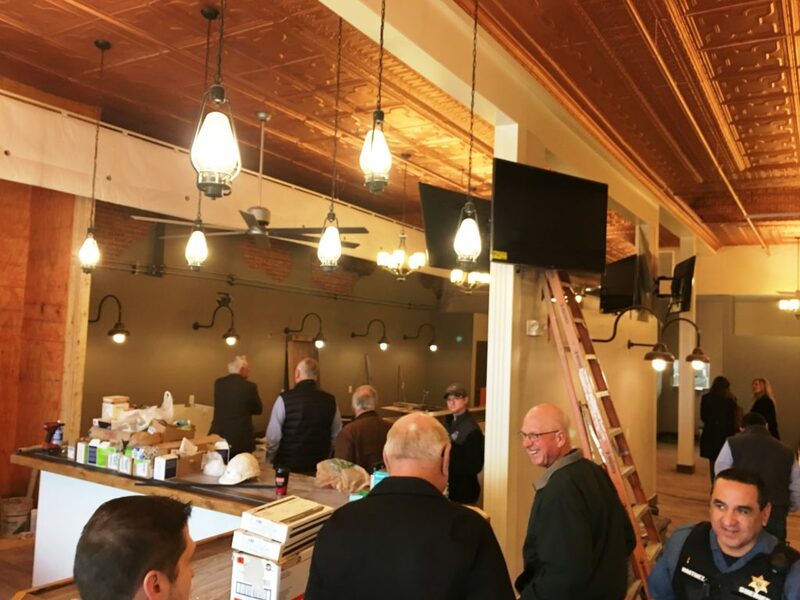 The plan for the upstairs space, which will likely be completed around next May, is for a membership type space, a “place to get away from things,” Chappel said. Smoking will be allowed upstairs but not in the rest of the building. Chappel said the restaurant menu will have everything from steaks and pastas to traditional pub and restaurant food. Flat Mountain has hired a chef, “Chef Larry,” from Colby who has provided a lot of direction for how to organize and operate the kitchen. Chappel said he’s happy about the staff that has been assembled. To get the venture up and running, Flat Mountain worked extensively with Finney County Economic Development. “Everybody knows we’ve been working on a brewery forever for Garden City. We were really honored to get to work with John and his partners on getting this facility put together,” Lona DuVall, FCEDC president, said. The under construction upstairs level at Flat Mountain Brewhouse. FCEDC assisted Flat Mountain’s partners with business planning, workforce and management assistance and guided them through a CID process, which will allow the business to charge an extra penny of sales tax that will help pay for the not insignificant cost of renovating the old building. “With downtown buildings, the cost to repurpose them are often significant so anything we can do to help businesses retrofit is beneficial,” DuVall said. DuVall pointed out to board members and commissioners that the restaurant/brewery will have access both from Main Street and from parking behind the building to the west. “One of the challenges we have in the downtown district is people think we have a shortage of parking — we know we don’t because there are several lots but they’re on the back sides of buildings. So one of the things we talk about when people look to renovate downtown buildings is making sure it’s a two-way access. People can feel just as comfortable walking in the back door as walking in the front,” she said. Those who do come in from the west can can get a glimpse of the 320 gallon brew tanks and 160 gallon finishing tanks and other brewery equipment in use. Chappel said Flat Mountain hopes to have a soft opening on Dec. 27-28 and an official opening possibly the week of Jan. 7. The soft opening is a way to train staff and test systems. Flat Mountain has issued a notice on Facebook and in flyers posted on its windows that applications are being accepted for all positions in the bar and restaurant, including head chef, cooks, general manager, wait staff, bar manager and bartenders. Update: Flat Mountain has filled the head chef, bar manager, front line manager and general manager positions. All other positions are still open. Those interested in applying are asked to send a resume, cover letter and contact information to fultonsfoundersgcks@gmail.com. People can also like the Flat Mountain Brewhouse Facebook page for more information.